Do-It-Yourself Wood Restoration Made Simple! RAD Cleaner InstructionsTips on Cleaning your Wood! RAD Brightener TipsTips on Brightening your Wood! RAD Stripper InstructionsTips on Stripping your Wood! 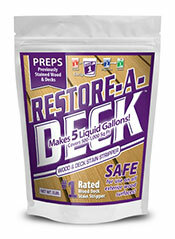 How-To-Restore A Deck in One DaySame Day Tips! 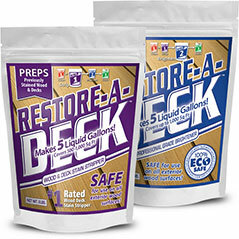 Restore-A-Deck Stain Hot Sun ApplicationAvoid the Hot Sun! 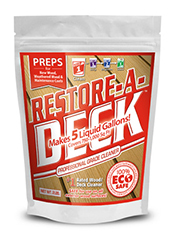 Deck cleaning and prep is a crucial step in any deck maintenance plan. Exterior wood must be cleaned prior to staining to ensure proper stain penetration and longevity. Let's compare the different types of deck cleaners and review how they can positively or negatively affect your wood deck. The purpose of cleaning wood is to remove any dirt, grime, mold, mildew, graying, or mill glaze that may prevent the deck stain from performing as it should. Exterior wood cleaners aid in the scrubbing or pressure washing of wood prior to staining. 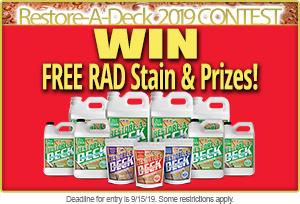 Deck cleaners primarily consist of caustic soaps that make the cleaning process both easier and more effective. 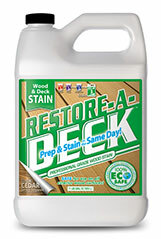 Because of the caustic condition of most deck cleaners, the wood's pH balance is raised during cleaning and will appear very dark. It's important to apply a deck brightener to the wood once it is cleaned. This cancels the caustic level by restoring the pH balance and enhances the beauty of the wood. Oxygenated based wood cleaners contain a registered ingredient by the EPA for removing mold and mildew called Sodium Percarbonate. In addition to this active ingredient other surfactants are blended in that help "boost" the overall cleaning power. Oxygenated deck cleaners come in a concentrated powder formula that is mixed with water prior to use. 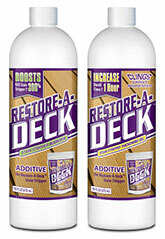 Liquid form deck cleaners are commonly found in the big box stores. They are concentrated liquids that mix with water to remove most soils on all hard deck surfaces. These products are designed for safe handling by consumers but from our experience, this makes them less effective at cleaning. Most of them contain citric and phosphoric acid along with other biodegradable surfactants. Acid naturally lightens wood but isn't the best cleaning agent. Some of the older types of deck cleaners consist of an ingredient called Sodium Hypochlorite better known as bleach. Bleach is excellent at removing mold and mildew. These wood cleaners also contain other surfactants that help remove dirt and grime. These cleaners are premixed in liquid form. Bleach deck cleaners tend to whiten the wood. Recent evidence shows that bleach may damage the cellular structure jeopardizing wood integrity. 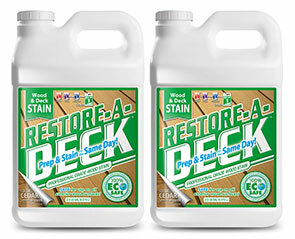 In our finding the Restore-A-Deck Oxygenated Deck Cleaners seem to be the best choice for cleaning and prepping wood. The concentrated powder form is less expensive than other products. 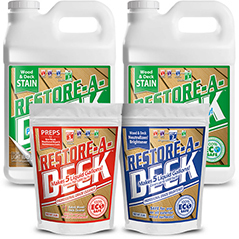 The EPA registered ingredient for mold and mildew removal along with other soapy surfactants are designed to make wood cleaning easier and more effective than other products we tested.